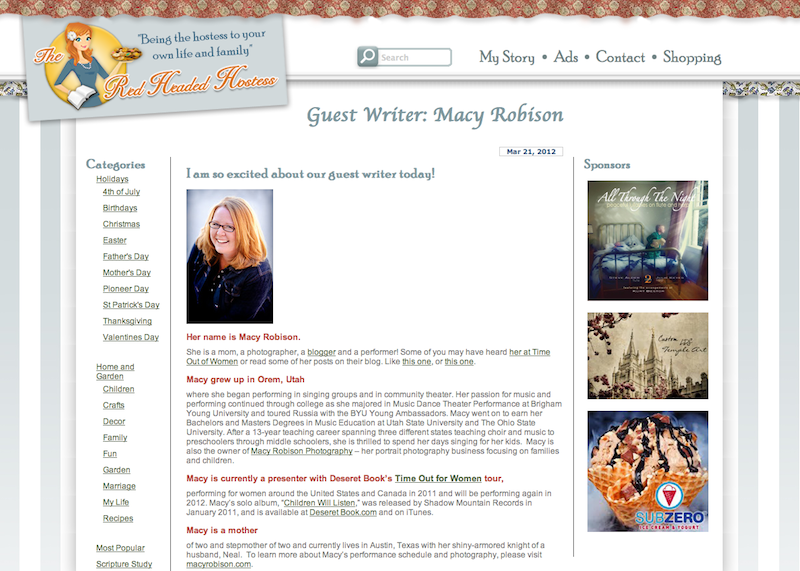 I'm so thrilled to be guest blogging for Shannon at The Red Headed Hostess today. I discovered Shannon's blog when our mutual friend's wife (did you catch all that?) wrote a guest post about the Proclamation on the Family and I have been reading and loving Shannon's posts ever since. And then I realized that I had attended one of her institute classes with our mutual friend - I still have tons of notes in my scriptures from that class - and I was even more excited about her blog. Plus, she's a fellow red-head. Need I say more? She also has a fantastic section with ideas for Young Women's activities and lessons. I'd love to hear what great things you find on Shannon's blog! Come back and leave me a comment or a link and share the goodness!